Getting protein into the bodies of teenagers after a workout is so important. It helps with muscle recovery and fuels the body. My son is a competitive swimmer and his team meets most mornings for conditioning and weightlifting. He grabs a healthy snack on his way to the gym but he needs the right breakfast before he starts school. We (parents) prepare a healthy breakfast every morning for our swimmers. Breakfast usually consists of egg casseroles, breakfast burritos, baked oatmeal and other protein rich breakfast choices. We are feeding 28 hungry swimmers and they are so grateful for our morning contribution. It’s also great team bonding. We have to make enough for everyone and taking a turn at providing breakfast for a large group can be challenging. I came up with this recipe as an alternative to eggs. After all who doesn’t love pancakes for breakfast. Bonus if they’re healthy for you. 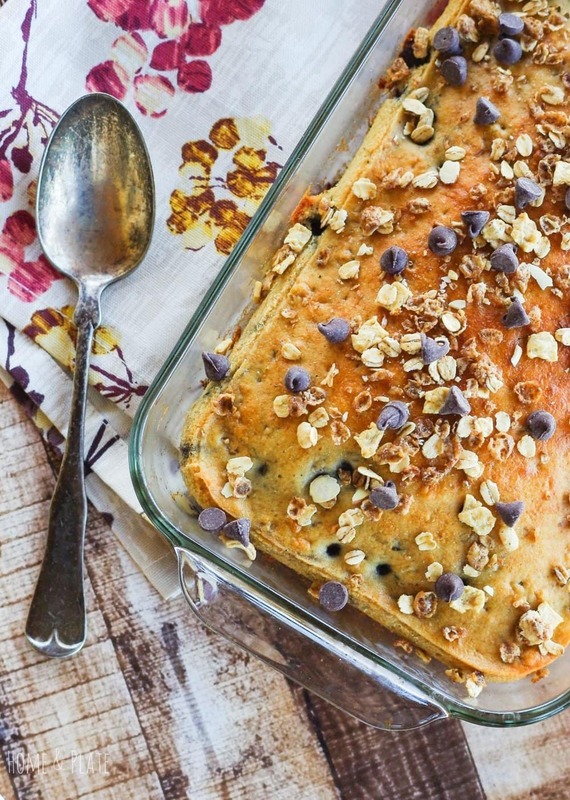 A mix of pancake batter and protein rich granola give this bake a cake-like consistency and frozen blueberries and semi sweet chocolate chips provide enough sweetness that no syrup is necessary. Make the pancake batter from scratch using my easy recipe or use a boxed mix. I added protein added granola to the batter which serves up 10 grams of protein per serving. You can find many brands of protein granola in the organic section of your local grocery store. Granola is chock-full of oats, ancient grains and seeds and of course, honey. It’s delicious right out of the box. If you prefer homemade granola, I have a recipe for that. Just stir in your favorite protein powder to the oil and maple syrup when combining the wet and dry ingredients. 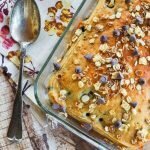 This granola pancake bake would also be a delicious dish to serve on a holiday morning. Be sure to check out a few of my other breakfast recipes to feed a crowd. Preheat the oven to 350°F. Spray an 11x7 inch baking dish with cooking spray. In a bowl mix together the pancake mix, milk, eggs, canola oil and granola. 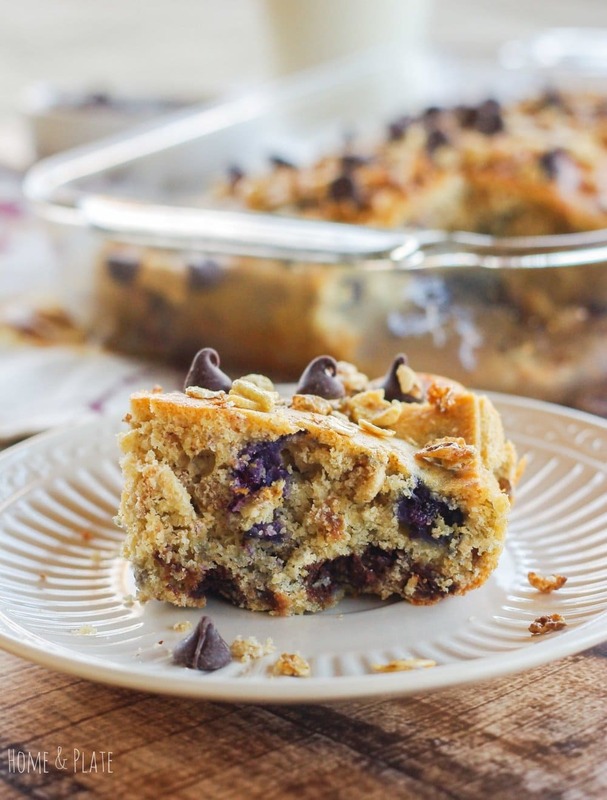 Stir in the blueberries and chocolate chips. 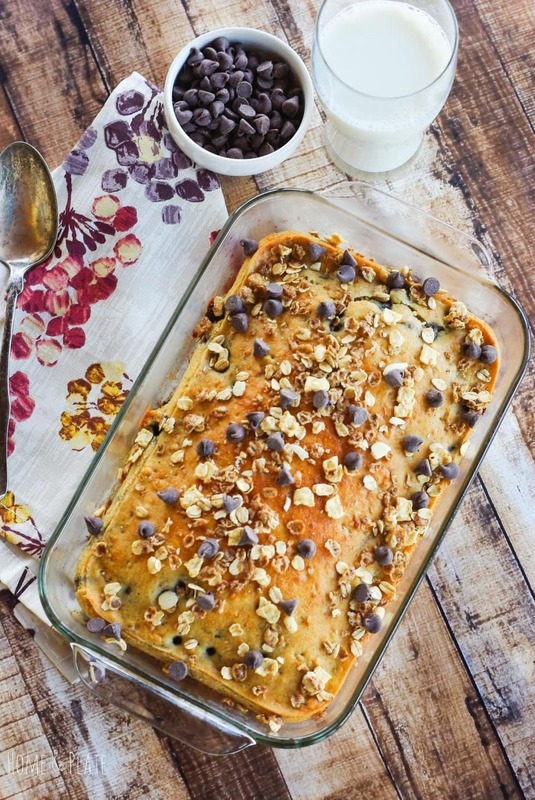 Reserve a handful of chocolate chips and granola for garnishing after baking. Pour the mix evenly into the baking dish and bake for 40 minutes or until the pancake batter has become firm and golden on top. 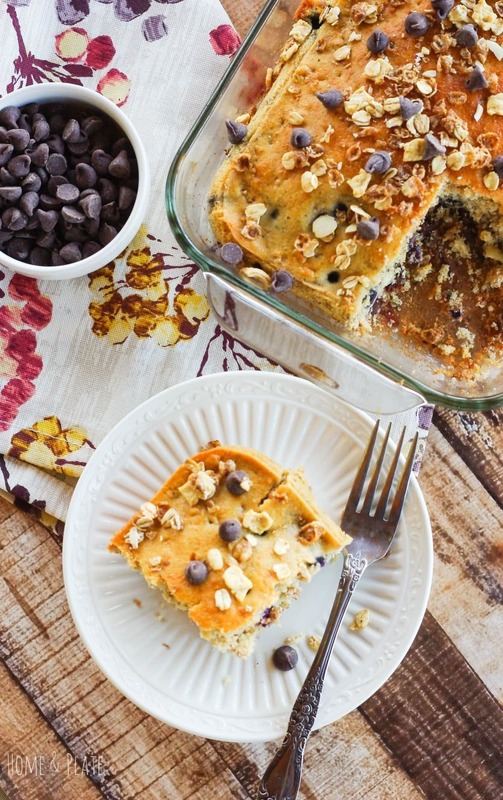 Immediately sprinkle a handful of chocolate chips and granola on top. Whta a great idea, your pancake bake will ne on my brunch tables very soon! Thanks Claudia. It will be on my breakfast table this holiday season too. Oooo, love this! I always hate making regular pancakes because the first ones are always cold by the time the last ones are finished, which is always a bummer, but this looks perfect! Thanks so much. And it serves a crowd which is the best part. Hope you like it. Great timing! Was just talking to my kids this morning that we need to come up with some more breakfast ideas for them. This is perfect! This recipe was a hit amongst 30 teenage swimmers. I promise it will go fast. OMG! I don’t think you could have made this look ANY better!! Hubba Hubba!